To quote CERN’s own published documentation: "Some theories suggest that, beyond the three spatial dimensions we experience, our Universe has some extra dimensions. These have finite size, so they are curved onto themselves, for instance in the shape of a circle (although, for more than one extra dimension, more complicated geometries are possible)." CERN and other concerns. Are you ready for the present? This is an excerpt from the Freeman Perspective with William Henry which aired January 4th 2007. Watch as William Henry and I discuss CERN and possible connections to technology from ancient Atlantis. If we calculate the number of the beast we find many interesting connections to the corporate world. Consider that if you transliterate the numbers 666 into English you get FOX. This is how this works: F is the 6th letter in the alphabet, O is the 15th, and X is the 24th, the final computation is 6, 1+5=6, and 2+4=6. So, we have 20th Century Fox, Fox Searchlight (referring to Lucifer) and Fox Mulder. It has been shown that Fox and Scully’s characters can be equated with the story of Osiris and Isis. Looking into numerology in the X—Files we find that Chris Carter’s production company is ten-thirteen. This is the infamous Friday the 13th when the Templars were burnt at the stake. Chris Carter showed us the entire “truth” about 9/11 in the pilot episode of “The Lone Gunmen”, a spin-off from the X-Files and this psi-op show is used to discredit anything “out of the ordinary”. Let go a little deeper. The type of magic that is being practiced by our leaders is Kabalah. This is based in Hebrew. Therefore, in Hebrew 666 would look like VVV because 6=V in Hebrew. The VW logo incorporates the VVV in its logo with 2 V’s interlaced making a third, equaling 666. The 2 V’s symbolize the number of the Qlippoth; of the “Dark Side”. See our president “VV” as he stands in front of the Woodrow Wilson Center For Science with the interlaced VV’s. That’s a lot of Beasts! Our corporate logos can be classified within Masonic ritual and therefore within the Kabalah. Freemasonry is Kabalism. So, when you see a pentagram on Texaco and a shell on Shell you can know these are symbols of Venus. Venus is Lucifer. 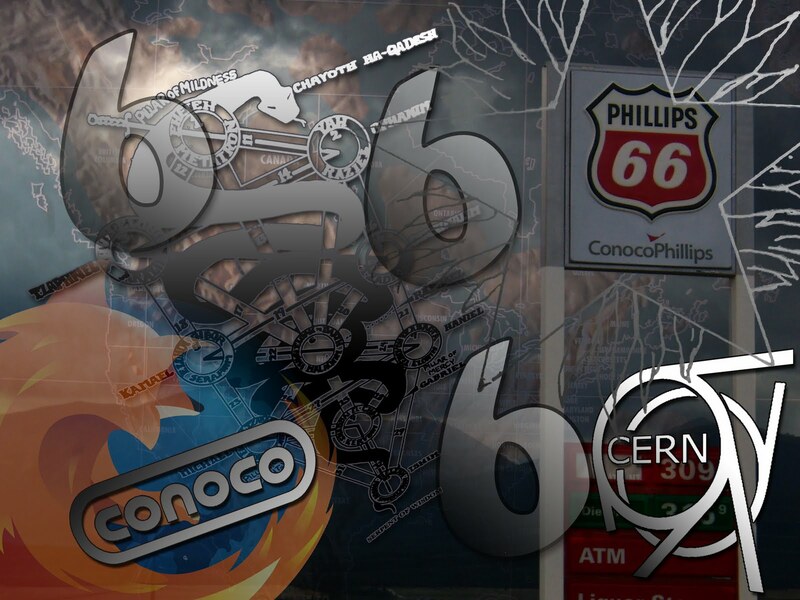 Go a step further and you see Phillips 66 (VV) and we’re back to the “Dark Side” which is also defined as excrement. Excrement, “W”? That fits. He is the grandson of the Beast 666. You might also notice that Phillip’s 66 crest has 6 points and we’re back to the Number of the Beast. Could this be real? Let’s try another. Conoco, hmmm? Hebrew does not use vowels so we’ll pull the O’s to the side for a second. Now, we have CNC. In Hebrew C = 20 and N = 50 therefore CNC = 90. The mysticism of the Kabalah is encoded in the Tarot. In the Tarot the number 90 is equal to the Star and were back to the pentagram. Now for the O’s. In modern Hebrew V,O, and U are considered the same. Therefore, Conoco’s logo can be transliterated into the Pentagram and the Number of the Beast, 666. Now let’s look at CERN’s logo. What do you see? 666 coupled with a Stargate to another dimension? Skull and Bones is what I see. Should we be conCERNed about "Red-Button" Day? "The Grid" has many capabilities that are not discussed by Faux News. Here's what they say: The latest spin-off from CERN, the particle physics centre that created the web, the grid could also provide the kind of power needed to transmit holographic images; allow instant online gaming with hundreds of thousands of players; and offer high-definition video telephony for the price of a local call. David Britton, professor of physics at Glasgow University and a leading figure in the grid project, believes grid technologies could "revolutionise" society. "With this kind of computing power, future generations will have the ability to collaborate and communicate in ways older people like me cannot even imagine," he said. The power of the grid will become apparent this summer after what scientists at CERN have termed their "red button" day - the switching-on of the Large Hadron Collider (LHC), the new particle accelerator built to probe the origin of the universe. "The Grid" will be activated at the same time to capture the data it generates. CERN has placed a statue of Shiva in front of their building complete with "Skull and Bones" motif. This God of creation and destruction has a plaque quoting from Fritjof Capra's "Tao of Physics" which explains the significance of the metaphor of Shiva's cosmic dance. 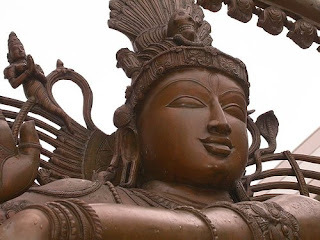 Here is the text of the plaque: Ananda K. Coomaraswamy, seeing beyond the unsurpassed rhythm, beauty, power and grace of the Nataraja, once wrote of it "It is the clearest image of the activity of God which any art or religion can boast of." More recently, Fritjof Capra explained that "Modern physics has shown that the rhythm of creation and destruction is not only manifest in the turn of the seasons and in the birth and death of all living creatures, but is also the very essence of inorganic matter," and that "For the modern physicists, then, Shiva's dance is the dance of subatomic matter." working on discovering its secrets. Scientists at CERN are in a race with Fermilab, in Batavia, Ill. to discover the God Particle, a fundamental, but elusive, sub atomic particle that is given divine proportions by its moniker, the God Particle, and dark matter, the invisible, enigmatic substances that together are thought to comprise 96 per cent of the mass of the universe. I discussed these ideas with William Henry on the Freeman Perspective January of last year. Watch as we explore the possible connections to ancient Atlantis and this new technology. This is a moment the New World Order has been waiting for. The processing power of "The Grid" will allow for A.I. type computing able to determine the outcome of future human events and process who will be in the detention camps created by National Security Presidential Directive 51. The LHC (Large Hadron Collider) will be activated in conjunction with "The Grid" in the middle of June which is titled "Red-Button" Day and the first collision will occur 2 months later.